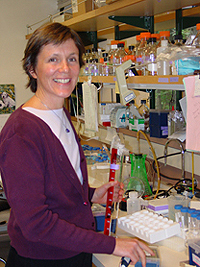 Lindsay Hinck, associate professor of molecular, cell and developmental biology. The California Institute for Regenerative Medicine (CIRM) has approved a $2.7 million grant to fund a stem cell research facility at UC Santa Cruz. The facility will be shared by UCSC researchers using human embryonic stem cells in efforts that may ultimately lead to new therapies for conditions ranging from Parkinson's disease to birth defects. The grant provides funding for the renovation of 2,000 square feet of laboratory space in the Sinsheimer Laboratories Building, as well as equipment and staffing for the new laboratory. It was among $50 million in facilities grants approved by the CIRM governing board on June 5 to fund shared research laboratories at 17 California research institutions. In previous rounds of funding from CIRM, UC Santa Cruz has received $2.2 million dollars in stem cell research grants and training grants. "We have an interdisciplinary group of researchers that has done a great job of coming together to build a stem cell research program at UC Santa Cruz," said Lindsay Hinck, associate professor of molecular, cell, and developmental biology, who will direct the new stem cell facility. Bruce Margon, vice chancellor for research, noted that UCSC has received the same level of support from CIRM as much larger campuses, such as UC Berkeley and UC San Francisco. "It speaks to our emerging visibility in this area of research," Margon said. "We have a small but very powerful cadre of researchers in this field. They have promising ideas and are ready to proceed, so this award comes at the right time." Stem cell research in the United States is currently limited by federal policy that prohibits research involving human embryonic stem cells isolated after August 2001 from being conducted in laboratories constructed with any federal funding. The new facility, constructed with state funding, will enable UCSC researchers to use new lines of human embryonic stem cells in their research. "It has become clear that the few lines of human embryonic stem cells approved under the federal policy are very limited in their usefulness," Hinck said. "They don't grow well, many of them are contaminated, and they were derived in suboptimal conditions. So it is really important to be able to bring in new stem cell lines that can open up the potential for medical breakthroughs." Stem cell research projects at UCSC are aimed at providing insights and tools to address neurological and genetic conditions such as Parkinson's disease, amyotrophic lateral sclerosis (ALS, or Lou Gehrig's disease), and Down syndrome. This research will also aid in the development of gene therapy strategies. UCSC researchers aim to elucidate the molecular and cellular mechanisms that regulate stem cell self-renewal and differentiation. Drawing on their broad range of expertise in development, genetics, genomics, and molecular, cell and computational biology, these researchers are using interdisciplinary approaches to tackle problems concerning how genes are regulated in human embryonic stem cells, and how this regulation influences their ability to both self-renew and differentiate into specific cellular subtypes. Defining and ultimately controlling this process is an essential step in designing medical therapies based on the use of stem cells. CIRM was established in 2004 with the passage of Proposition 71, the California Stem Cell Research and Cures Initiative. The statewide ballot measure, which provided $3 billion in funding for stem cell research at California universities and research institutions, was approved by California voters and called for the establishment of an entity to make grants and provide loans for stem cell research, research facilities, and other vital research opportunities. CIRM is the largest source of funding for human embryonic stem cell research in the world. More information about CIRM is available online. Note to reporters: You may contact Hinck at (831) 459-5253 or hinck@biology.ucsc.edu.